Close claims quickly while providing the care your injured workers deserve. When your work comp claim isn’t managed properly, it can quickly spiral out of control and severely impact your employees’ morale and productivity—potentially costing your company a lot of money. 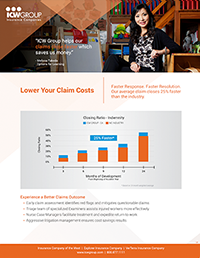 With ICW Group, you gain more control over your claims. You work with a team of dedicated claim professionals that truly understand your and your injured worker’s needs. Faster response. Faster resolution. Lower costs. Personalized attention from examiners with the lowest caseloads in the industry. Key issues caught early by expert Claim Triage Teams. Claims receive immediate attention from First Notice of Loss team. Concierge service by dedicated Claim Service Consultants. Our exclusive ICW Group Premier Medical Provider Network (MPN) services in California. Fraudulent claims reduction by our Special Investigation Unit. Online Claims kit, available for every state, in the Workers’ Compensation Policyholder Center. Easy access to Loss and Claim Summary Reports, injury trending, tracking tools, and OSHA reporting, with myResource.